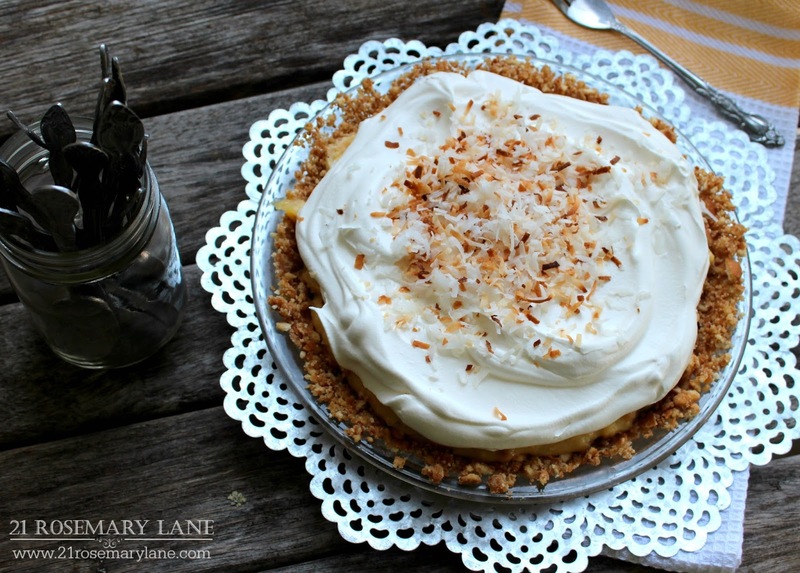 21 Rosemary Lane: Simple Banana & Coconut (Cream) Dream Pie!! Summer is here and it is time for those yummy refrigerator pies to make an entrance! 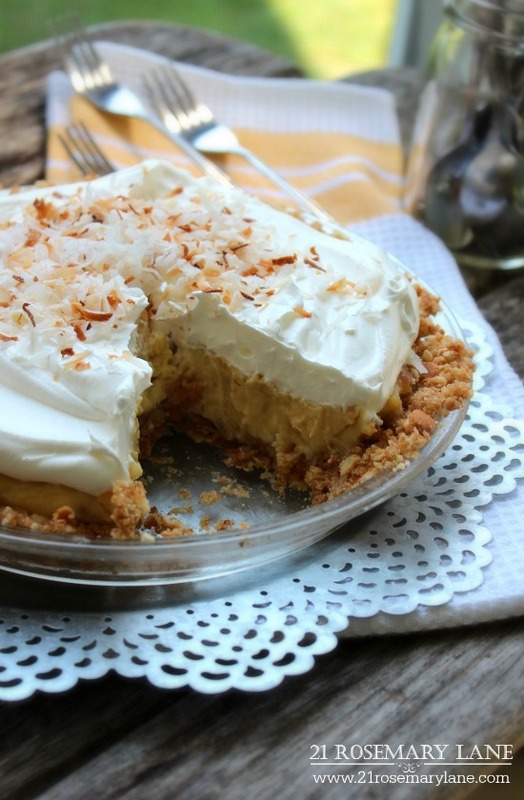 This recipe takes the classic cream pie to a tropical level with both banana and toasted coconut as part of the filling. 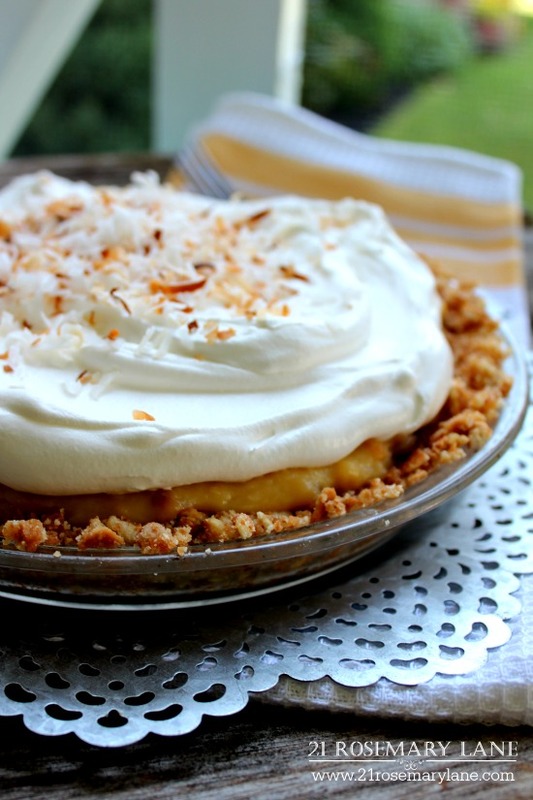 Then it's topped with some whipped cream and more toasted coconut all sitting in a crumbled vanilla wafer crust! And the best part is that it is easy peasy to make!! The basic recipe I used is from Eagle Brand only I made a couple changes. First, instead of using a graham cracker crust, I decided on a vanilla wafer crust. For some reason I just thought vanilla wafers would go better with the whole banana flavor thing. This was easy enough to make, although I should have opted to use my food processor to crumble up the cookies instead of pounding them down manually using my trusty rolling pin. Just mix the cookie crumbs with butter, about 1/3 cup butter to 1 1/2 cups cookie crumbs, and press into a 9 inch pie plate. Then for the whipped cream topping I just used good old Cool Whip instead of whipping up my own from heavy cream. This what helped to make the recipe so simple. Start by dissolving the 3 T of corn starch in the water in a medium size pot. Then add the sweetened condensed milk and then slowly add the egg yolks all the while stirring consistently with wire whisk over medium heat until the mixture becomes thick and bubbly. Remove from the heat and add the butter and vanilla extract. Then let it cool slightly before adding the 1/2 cup of toasted coconut. Slice your bananas and dip into the lemon juice, this will prevent them from turning brown. 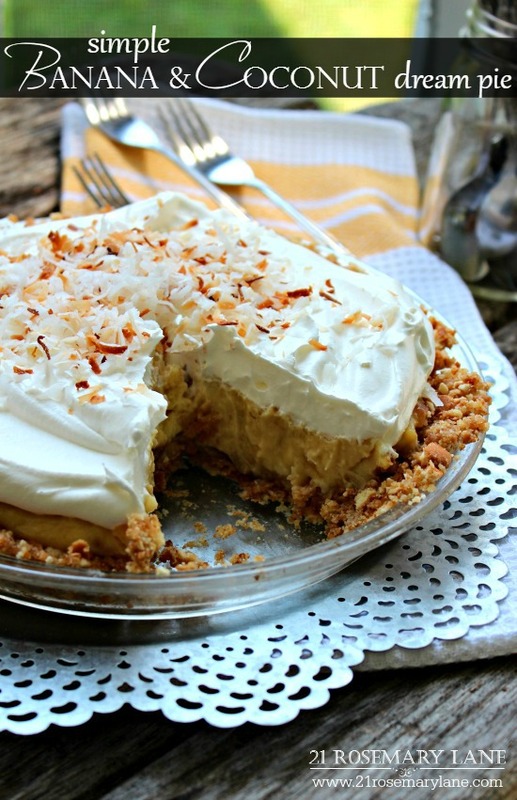 Arrange slices in the bottom of the pie crust and then add your coconut cream filling. Cover with plastic wrap and refrigerate for at least 4 hours or until set. Before serving, remove plastic wrap and top with the whipped cream then garnish with the remaining toasted coconut. Mr. Rosemary Lane and the kiddos LOVED it! Mr. RL said it was super creamy and even my son Michael, who is not the biggest fan of coconut, gave it a hearty thumbs up! I do love pie, but it has been so hot here I am reluctant to heat up the kitchen. This sounds delish. Oh my, this looks scrumptious!!! I can't wait to make this. Thanks so much for sharing the recipe!!! Wow! This sounds amazing, and doesn't sound too difficult! I will have to be careful I don't scorch it on the stovetop. I would like to invite you to come and share this at the Celebrate Your Story! link party. Here is the link if you have the time to join us: http://www.21rosemarylane.com/ I am pinning this one to my pie and tart board! Ok, I would like a piece please. This looks amazing. Thanks for sharing this with us at Celebrate Your Story. Just this morning I was thinking of Coconut Cream pie, it was one of my father's favorites. Have a fun weekend and I hope you join us again! T is the abbreviation for tablespoon ans tsp. is short for teaspoon. Hope this helps!